Barcelona line-up: Valdés, Adriano, Piqué, Mascherano, Daniel Alves, Fabregas, Busquets, Iniesta, Alexis Sanchez, Pedro, Messi. Barcelona got away of Almeria stadium with the 3 points in the bag, but this time there was no Neymar on the pitch. Tato Martino decided to rest the Brazilian star, but the Blaugrana still managed to come out with the win in a dificult visit to Almeria. Lionel Messi broke the deadlock in the 21th minute, shortly after he saw Daniel Alves picking up a long ball near the corner flag on the right. The Argentinian then went with a short pass combination with Pedro, got past a couple defenders and struck the ball to the far post. His shot would still hit the woodwork before going in, as Almeria goalkeeper couldn’t have anything to stop it. However, the bad news from this game occurred shortly after the opener, as Lionel Messi picked a muscular injury on his right leg thigh, after doing a big sprint to chase a long ball. 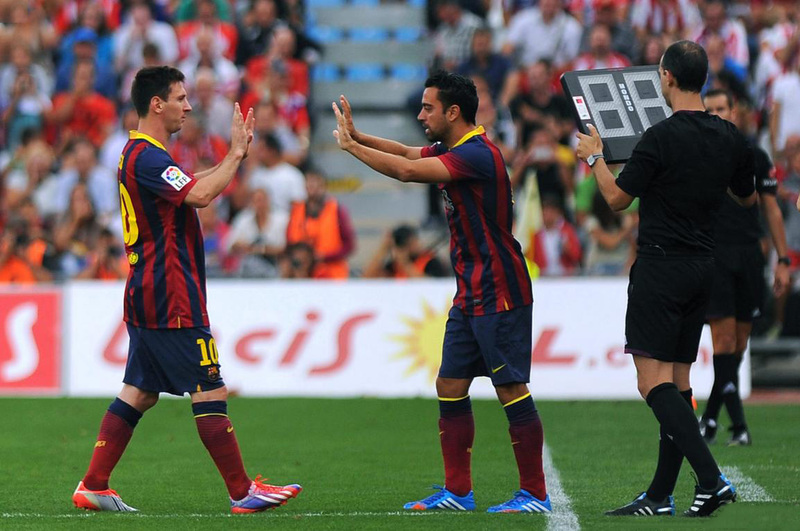 He got replaced by Xavi a few instants later and according to several reports released by the club after the game, Messi is expected to be injured for the next couple weeks and hopefully make his return on October 19, in a away fixture for La Liga against Osasuna. The 0-2 got scored after the break, when Xavi, Adriano and Fabregas built up a quick attacking play already inside Almeria‘s penalty area. The former Arsenal midfielder assisted Adriano in the center of the area for a sliding tap-in and Almeria‘s chances of still coming back in the game immediately went down the drain. Barça‘s next game will be in the UEFA Champions League against Celtic Glasgow, and it’s more than likely that Neymar will start on the line-up with Lionel Messi being sidelined and the Brazilian having rested this weekend.